Jean-Claude Thoral - Kobelco Construction Machinery Europe B.V. The historical village of Saint-Boil, located between Buxy and Saint-Gengoux-le-National in the Bourgogne region in Eastern France is surrounded by lush greenery and vineyards. Home also to a 12th Century church and a Gallo-Roman quarry, the area is particularly popular with tourists who come to sightsee and hike through the picture-postcard streets before enjoying a glass of the region’s best red wine. Today the village seems quiet and sleepy. That is, aside from the gentle hum of machinery somewhere on the outskirts of the commune. It is here where construction work is currently underway to replace an old water filtration system that fed the village with its supply of fresh drinking water. A new, more sophisticated filtration and water recycling plant is now being installed to service the village’s 500 inhabitants. Established in 1986 by Jean-Claude Thoral, Travaux Publics Du Sornin (T.P.S) specialises in earthworks, sanitation, road building and demolition. 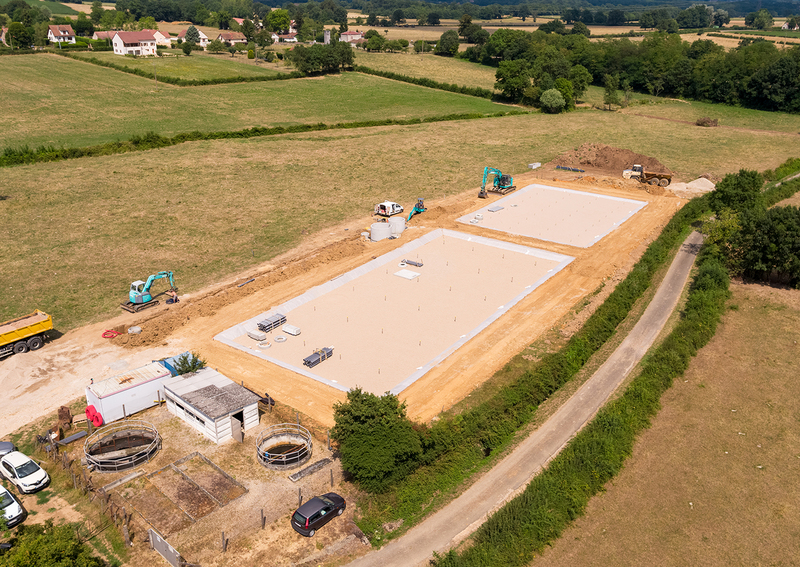 The family-run company, based close to Pouilly-Sous-Charlieu, have been working on the site at Saint-Boil since June 2018. 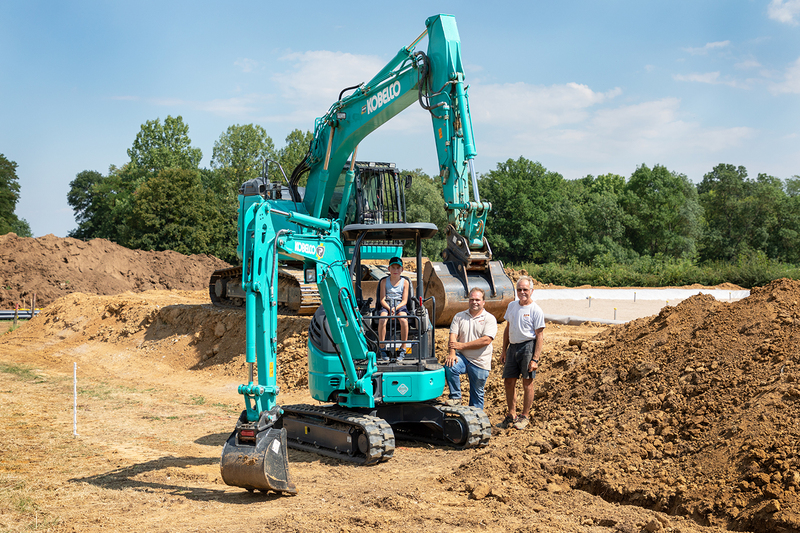 The family are big advocates of the Kobelco brand and currently have an SK230SRLC-5 and SK28SR-6 on site, as well as a much older SK70SR model. The replacement of the water filtration system in Saint-Boil is a big project and is expected to take around five months to complete. However, once finished, the new water treatment plant will clean and recycle wastewater from the village before pumping it back through the existing water system and back up to the village. This plant is of Scandinavian design and uses a series of gravels – from very coarse to very fine – to remove the unwanted sediment from the water and make it safe for consumption. Jean-Claude, 69, is still very hands-on in the company he runs with his son, Fabrice. In fact, work on this site is a real family affair with his 11-year-old grandson, Theo, also helping out during the school summer holidays. 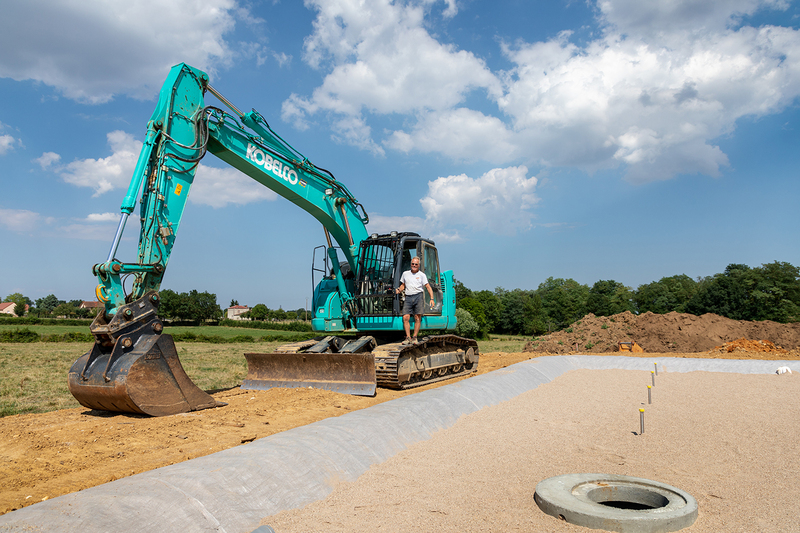 Today, Jean-Claude is using the SK230SRLC-5 to shift soil away from the filtration beds before using the machine’s blade to level the ground ready for trenches to be dug for water pipes. The SK230SRLC-5 has a short radius design, which means that it is ideally suited to working in restricted spaces. However, even on a relatively spacious job site like this, there are clear benefits to using a compact machine. For example, the rear of the SK230SRLC-5’s main upper body extends very little past the carriage crawlers to minimise the working area. This, combined with the machine’s continuous 180° dig, swing and load operations mean that Jean-Claude can operate within a very small working area of just 4.06m. 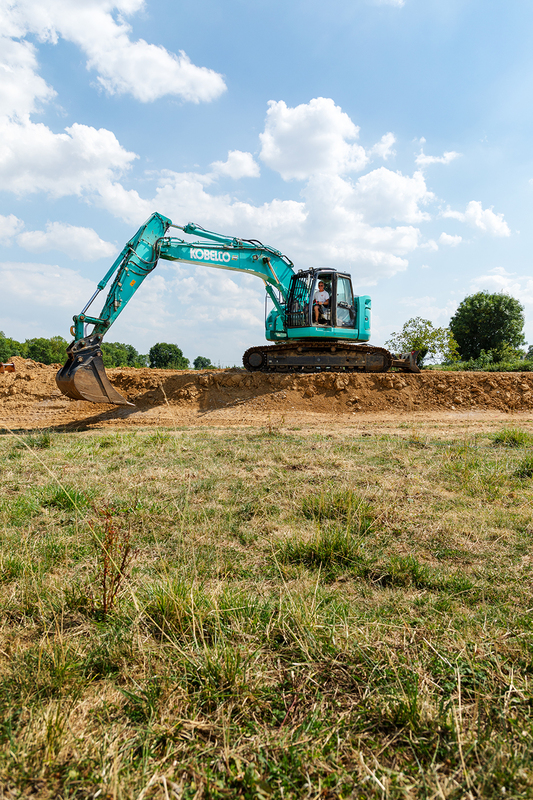 The Kobelco SK230SRLC-5 that T.P.S. is using is only a year old, but it seems that the family are already impressed with its performance. Fuel savings and powerful performance are a result of the SK230SRLC-5’s four-cylinder engine, which is equipped with a variable geometry turbocharger. This is used to provide the driving force behind the machine. While H-mode is designed for heavy working, even greater savings on fuel and other running costs can be achieved through the S and Eco-mode settings, which Fabrice is currently alternating between. 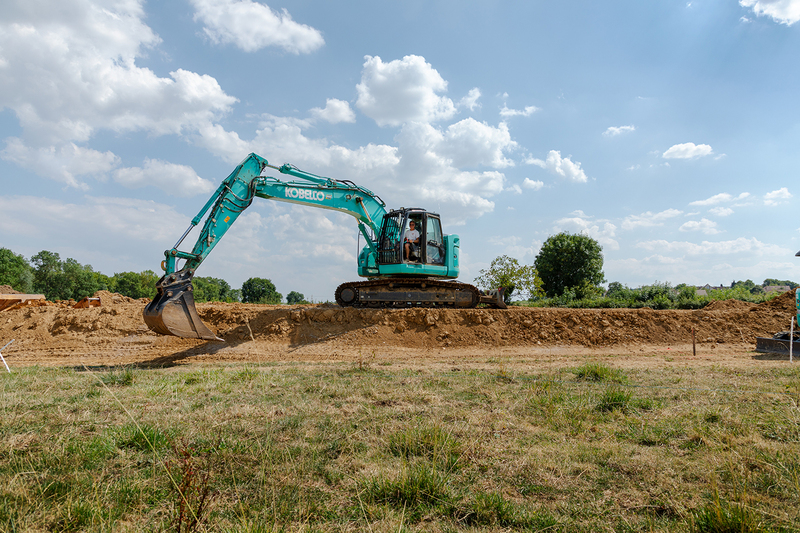 In addition, the SK230SRLC-5 is equipped with Kobelco’s innovative iNDr (Integrated Noise and Dust Reduction Cooling System) technology, which utilises an air filter in front of the radiator and a unique sound chamber to significantly reduce engine noise and keep the engine compartment clean. “The SK230SRLC-5 is surprisingly quiet to operate,” continues Jean-Claude. “We are working quite close to the village so it is important we don’t disturb the peace. It is very easy to keep clean too as all the compartments are easy to reach from the ground.